As the temperatures and crowds rise like a slow-motion wave, I can feel my patience wane. It is High Season in Arles. And yet, despite herding my two puppers between slack-jawed families that spread across our narrow streets Western-style and gingerly stepping over dropped strawberry ice-cream cones, there is a balm that goes right to my soul. Music. 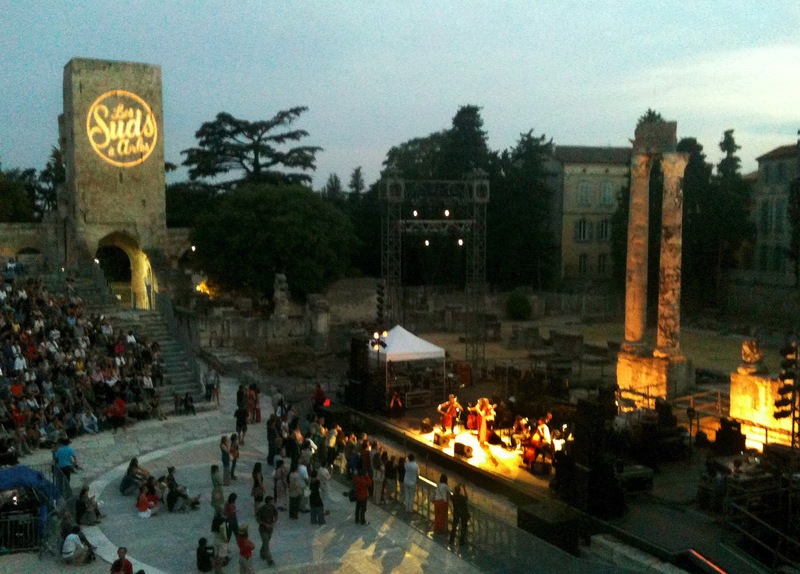 This year marks the 18th edition of Les Suds à Arles, one of Europe's most important world music festivals. And when I say world, it is as in scan the globe--from Senegalese rappers to a Balkan "rock star," a singer from the Mongolian Steppes with a four-octave range--not to mention a group of wacky Mad Maxian horn-blowers that Remi tried to drag me to hear in the mosquito-filled Camargue. Um, no thank you, sweetheart. For I had another style in mind entirely--the unique voice of Melody Gardot. Like smoke without scent, she is a conjuror. Those of you have been reading Lost in Arles for some time might remember hearing her work on various posts for she is one of my favorite contemporary artists. We had missed the opportunity to see her perform in Sête (an incredible open amphitheater overlooking the sea) two years ago and so pounced gleefully when this concert was announced months ago. It has been something that I have been looking forward to for ages, a Christmas present in advance. And yet a few hours before the concert, storm clouds hovered and a few warm splashes of rain evaporated into the concrete. Would my expectations be dashed? No, no, the skies were kind and the music...divine. We climbed to our traditional post in the very last row of the 2,000 seat Roman amphitheater (finished in roughly 12AD) and settled. Despite my knowledge of the rickety ascent, I always seem to wear something utterly inappropriate for the task. It has become my own little inside joke. A happy hush descended on the spectators as Silvia Perez Cruz, the opening act, took to the stage. Immediately, we all knew that we were hearing someone with an immensely expansive yet poetic talent. She has already conquered her home country of Spain with a seamless mix of Latin music--from habaneras to fado, folk and Cuban--and she is most certainly une vrai découverte. She lead the audience to relax easily into the evening. I love listening to the chatter of the entr'acte. Swifts raced through the darkening skies while children danced in the open orchestra--quite a change from when that marble floor had been preserved solely for the nobles with their moveable chairs during Roman times. From our faraway little corner, we spied the glow of the Artist's tent, directly under the tower of the St. Trophime Cathedral. As the lights dipped again and the musicians took their places, I was surprised to see a delicate figure being carried across the uneven terrain in the dark to the stairs leading to the stage. And then I remembered Melody Gardot's terrible accident in which, after being run over by a driver who had sped through a red-light, she was forced to go through many operations and a year of lying on her back in a hospital. There, she taught herself to play guitar (yes, on her back) and started composing music as a form of therapy. Despite her recovery, her perception of light and sound has been permanently effected, forcing her to wear dark glasses and to create music that started as a whisper then a hum. How far she has come. Listen. I know that being moved by her story is part of what initially drew me to her music. But while I still have enormous admiration for her determination to become such a fine artist (and someone who continues to be authentic in her life choices, which is important to me too), I can reassure you that there is zero thought on her past when she performs, rather she explodes in the present. The French word envoûtant best describes her presence and that voice, that voice that charms while singing or bantering in franglais. Such a beautiful evening with more than a little hint of magic. In one of her final songs before the encores she promised in a refrain, "I'm gonna go but I'll be back someday." I'll leave you with "Baby, I'm a fool," a song that she introduced by saying that it was "a good song to sing while in the bathtub"...Lovely, non? And I do apologize for the photo quality on this post but I really just wanted to enjoy and so alas, relied on the iphone, rather than be caught up in anything other than just the joy of being right there, right then! Oh! PS. I nearly forgot to mention that I did a guest post for the lovely food and travel writer Ann Mah for her Tuesday Dinner series that appeared yesterday. If you feel so inclined, you may find it by clicking the link: Here. I'm so envious. I first heard her music two years ago and read about her amazing recovery. She is fabulous. Such a strong woman. And her voice is outstanding. I would love, love to see her perform. It sounds like a stunning evening. Lucky you!! Jennifer--if you ever get the chance, GO!!! She is even better live--hard to imagine but oh so true. Yes, Jeanne. I agree. The woman has an amazing perspective and he talent points through that like a prism. How wonderful to sit in the Roman theatre and listen to the music. I am sure you can't help but reflect about the acts and people who sat in those same seats centuries ago watching them perform. Thanks so much for sharing. Have a great day. What a lovely report and it sounds like a perfect evening. I laughed as I thought of the contrast between your evening and mine which was spent in America's Sin City. . .such a difference a few thousand miles make! Beautiful report. Ooooh, Vegas. I won't snob Vegas. Especially now that there is such fine eats to be found. And thanks for the compliment, Jackie! Thank you for bringing this singer to my attention, her work is quite lovely. I did like the tart, in fact I am going to try and make one of my own if the heat breaks. Oh dear, I have been hearing of your heat wave thanks to my Mom and Sister in Ann Arbor. Heat PLUS humidity is just gruesome, there is no other word for it. Hope you enjoy the tart when you make it!! Aahhh. Melody Gardot, and in that space ... genius. How lucky you are!! Enjoyed your post immensely! Oooh, thank you so much! This was our one big concert for the summer so I am so glad we choose her--I knew it was going to be fabulous. Lucky you and lucky us! She will be performing in Helsinki on Monday and we will be there. We are just back from the concert, and what a concert it was! A hundred times greater than any studio recordings. The producers tend to keep those so smooth and pleasing to the crowds. We were so happy we experienced her live. The band was amazing, especially the guitarist and saxophonist, and she was fantastic. I don't think I will ever forget the way she performed 'So we meet again my heartache'. This is how I felt indoors in a concert hall and I can only imagine how magical it all must have been outdoors in an amphitheater. BTW, my husband and 20 something daughter lover it too. Wasn't that song amazing???? I agree! And oh, I am so happy to hear that you all had a great time. You know, she is only 28 so I am not surprised your daughter liked it too. I put her on my list for Jeanne's and the Music for Mango House!!!! Thanks, George. I have heard a pretty eclectic mix so far including Patti Smith and Massive Attack as well! All, amazing. Wonderful. Thanks for sharing the music and your evening with us. You're welcome, Joan. It was waaaay too good to keep to myself! Your shoes are lovely............!! !I would have tripped and stumbled all the way down those ancient stairs but NOT YOU!LOved the video at the end in the bath tub!Men in top hats........how can that be a sight for sore eyes?Her voice is BEYOND!Lucky you again for being there!THANKS FOR SHARING! Oooh, if you don't know her music, take a listen!!! It seems like something you would love. And my Sister mailed me those platforms last year for my birthday!!! Isn't that fabulous? Hence the photo and hence her comment too. 2000 seat amphitheatre means good seats for all. I love music fests. Exactly Cali girl. 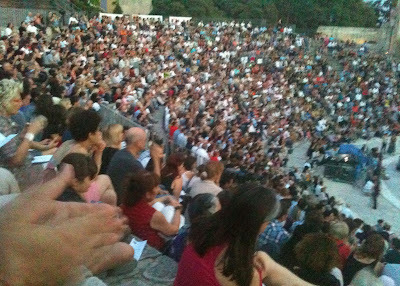 Unless you are hearing opera at the Roman theatre in Orange and then they squeeze you in so tight it is insane and it is far bigger than Arles! And so the power of music proves its magic yet again....such an encouraging story to know that she rose above her challenges to let the music out...some people really are inspirational to the rest of us mere mortals. Sounds like one of those utterly marvellous events where one thinks "this is living". And indeed it is. Indeed it is. But you inspire me for lots of reasons too, Virginia. Just saying. Aren't they great? You see I have this Sister. Not only is she wonderful, beautiful, funny and smart but she is a great Sister and bought these for me last year for my Birthday! I am lucky, aren't I? the french singer/composer and guitarist "Titi" Thierry Robin. Unfortunately his performances mostly take place in France. 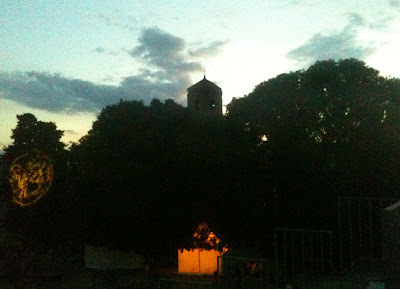 But I enjoy his extra ordinary music nearly every night on my terrace. If you are interested look in the internet or let me know and to send you some infos, music etc. would be a pleasure. One day I will also join the Fez Muic Festival in Morocco. Oooh, I would love to go to that festival too, Mumbai. And of course I have heard of Thierry Robin but have never listened to his music--I will now, so thank you! 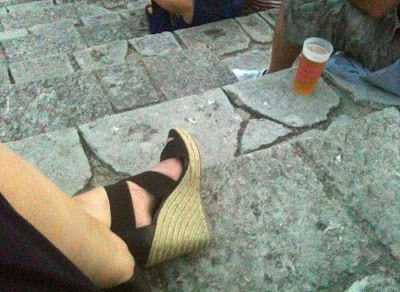 I truly don't know why I always want to wear such challenging footwear there but I feel like the venue merits it! My friend selected my tshirt dress--it was drapée so she felt that was perfect for a Roman theatre! As always you broaden my horizons! Love the shoes (wish I had a sister!) As always, I feel as though I am perched right on your shoulder. And I just listened to the video -- like a refreshing breeze on this hot, sticky, morning. So glad you have introduced me to Melody Gardot, I shall watch for her. Excellent! Off to buy some Melody Gardot! 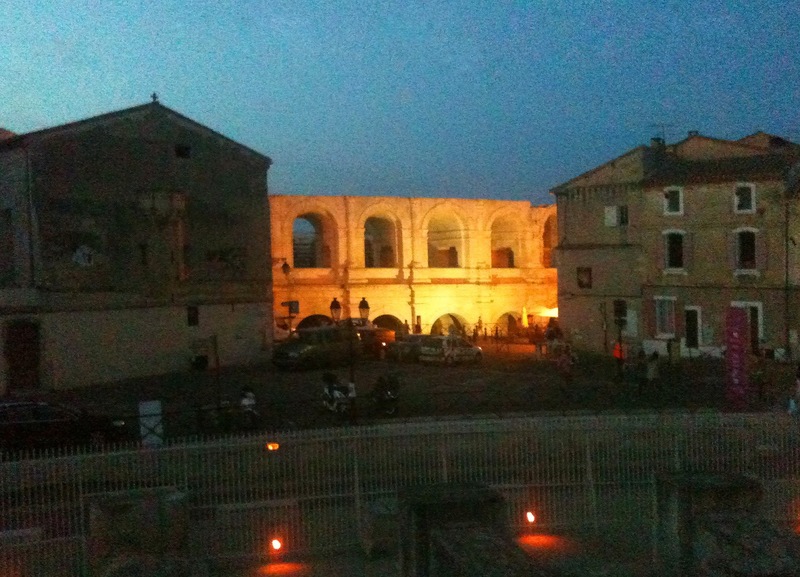 I was in Arles too ! the show was really fantastic. Michel, j'ai adorée votre post sur le concert. Un éclair! C'était bien ça! Your french is far better then my english ! Perhaps will you you enjoy with Dead Can Dance ? Oooh, c'était top, j'imagine bien. C'est sur qu'elle chante a merveille aussi, mais qu'est-ce qui se passe avec cette robe?! ?